For me, Daniel H. Pink's book Drive: The Surprising Truth about What Motivates Us (my brief goodreads review here) was one of those mind-blowing, look-at-the-whole-world-differently kind of books that only comes along every so often. In fact, I named it as one of my "Top Twelve of 2010" in my book review column at Meridian Magazine here. The very day that column was published, I got a nice little note from the author himself. Thanks for including DRIVE on your list of favorite 2010 books. Much appreciated. If you were listening very closely, you *might* have heard an embarrassing little fan-girl squeal when I opened that email. Maybe. So I admit that I was predisposed to like what I read in his newest offering: To Sell Is Human: The Surprising Truth about Moving Others. And I did. I really, really liked it. I'm one of those who shies away from the very idea of "selling something" or anything like unto it. As a newlywed finishing up my undergraduate degree in Provo, Utah, I took a job where my primary responsibility was cold calling people and trying to get them to answer various questions about different products and companies. I got assigned to the Viagra survey. Precisely two hours, dozens of phone calls and one partially completed survey later (the person put me on hold halfway through the survey and never came back), I was done. Totally and completely done. 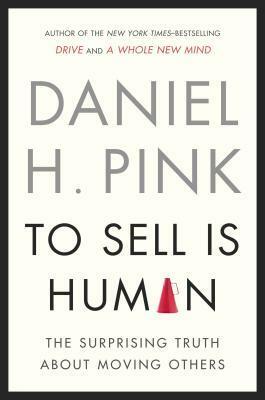 It's quite a triumph for Daniel Pink, then, to have so convincingly reframed the entire practice of "selling" as something that not only "everyone" does, but as something I personally do, too. It's no longer an activity limited to greasy-haired, slick-talking used car salesmen. It's now "the ability to move others to exchange what they have for what we have" and, Mr. Pink claims, it "is crucial to our survival and our happiness...It is part of who we are." Mr. Pink lauds the rise of small entrepreneurs, the elasticity demanded of employees by their employers, and the enormous growth of the "Ed-Med" sector (i.e., education and medical services) as major drivers behind the universality of selling. He notes that the information asymmetry that used to govern the buying/selling process no longer exists, in large part due to the internet providing easy access to data. With that, the advantages of the sellers have all but disappeared and the act of selling, or "moving", has become much more democratized. In this brave new world where selling is the norm for just about everyone, a different mindset is required. Rather than the old maxim Always Be Closing, the qualities of Attunement, Buoyancy, and Clarity have charged to the forefront. To sum up, in order to be successful, one must cultivate the empathy to be "in tune" with others and see from their perspective; the resilience to bounce back from rejection; and the ability to define the right problems and ask the right questions. Likewise, Mr. Pink points out three skills have become increasingly important: pitching, improvising, and serving. Pitching is "the ability to distill one's point to its persuasive essence." Improvising, similar to and drawing inspiration from theatrical improvisation, shifts the focus to finding creative "win-win" situations rather than the old-school zero-sum way of thinking. Finally, Mr. Pink provides "a broader, deeper, and more transcendent definition of service" as it relates to both sales and non-sales selling we all do: "improving others' lives and, in turn, improving the world." It all sounds so lofty, doesn't it? But what's remarkable about To Sell Is Human is that Mr. Pink breaks each of these skills and qualities down into realistic, actionable steps the reader can take to improve his/her ability to "sell". Or just to be more successful at whatever endeavor. Mr. Pink grounds his suggestions in hard science. For example, in the section on buoyancy, he quotes a fascinating social science study done in Brazil that calculated the optimum ratio of positive to negative emotions. Apparently, the study showed that three positive emotions for every negative emotion was the lowest ratio that demonstrated an improved well-being. Interestingly, experiencing more than about ten positive emotions to each negative emotion "does more harm than good" as "life become a festival of Panglossian cluelessness, where self-delusion suffocates self-improvement." He also describes a series of several studies that show how to frame choices to provide greater clarity; the most effective techniques include using the contrast principle, deliberately restricting the number of options available, emphasizing the experiential and potential elements of a sale, and even pointing out the flaws of your offering. Above all, this book is practical. Mr. Pink provides concrete actions to take that will improve job performance, personal well-being, even the quality of our relationships, as we consciously work to refine our ability to move others. Buy it from Amazon (hardback, paperback, ebook, or audiobook) here. Find it at an independent bookseller near you here. Look it up on goodreads here.